We started Bounce Milwaukee to create a space where both adults and children can have fun playing. Similarly, we want to be a place where our employees are excited to come to to work, and where they are an active part of an organization. Our staff is involved in brainstorming, decision-making, and every aspect of our growing organization. We don't believe in paying employees as little as we can get by with. We believe that when Bounce Milwaukee is making a profit, the employees who are responsible for that success should do well, too. To that end, employees receive quarterly bonuses in-line with how we're doing. In short: when Bounce Milwaukee does well, we all do well. This compensation is on top of an hourly wage (always over the minimum wage) as well as tips. We offer benefits like health insurance, an employer-matched SIMPLE IRA, paid time off, paid training, and reimbursements for higher educational expenses (for you or your dependent children), discounts on food and entertainment, and paid meetings which ususally involve beer and pizza tasting. 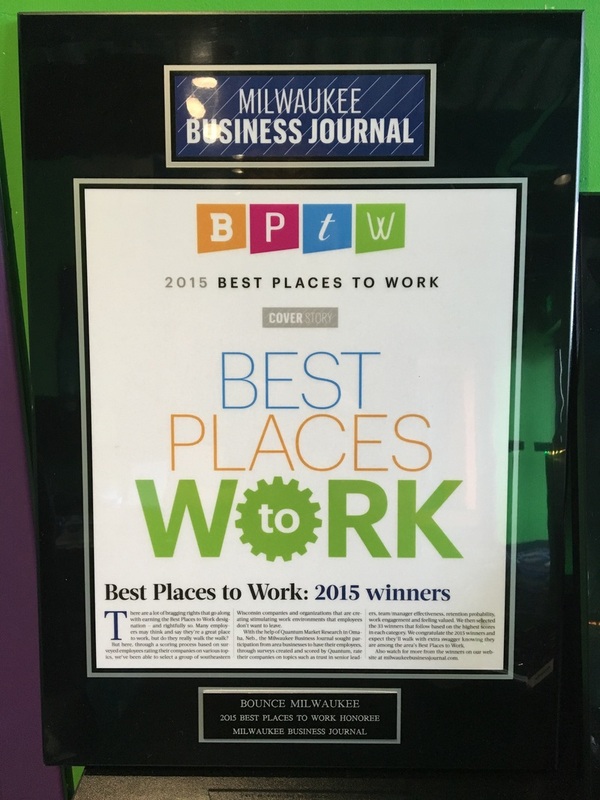 ​We've also been named one of Milwaukee Business Journal's Best Places to Work! update: We made #1! Read the whole article here! Outgoing? Love working with children and adults? Let's talk. We always accept applications for employment, even when not actively hiring. Applicants must fill out both the online form on this page and email a resume with references to bouncemilwaukee@gmail.com to be considered. We'll invite the candidates with the strongest applications to a slightly unusual audition at Bounce Milwaukee, where we'll be putting you through some rigorous (but fun) activities to ensure that you're a good fit for us (and that we're a good fit for you.) The most successful applicants will be able to problem-solve and improvise while being outgoing with children and adults. The best candidates will undergo background checks and be interviewed one-on-one. Bounce Milwaukee hosts are the heart of our organization. We're looking for people who are always smiling and go out of their way to make sure everyone is having a great time. You will receive extensive instruction on operating all of the attractions, hosting the front counter, food service, and cleaning/maintenance. This position will offer a lot of opportunity for flexibility and creativity, as you'll rotate to different tasks throughout any given workday. As positions become available, hosts who have consistently delivered excellent customer experiences may be promoted to party hosting. This position can be part- or full-time. All employees begin as hosts, but can be quickly promoted from within to Party Hosts, Managers or other positions. Every member of the team at Bounce Milwaukee is a host, but only a select few will be chosen to become party hosts. Party hosts are extensively trained to operate each of the attractions (laser tag, the inflatable sports arena, the rock climbing wall, vintage games and the inflatable obstacle courses). You will also receive instruction on hosting the front counter, food service, and cleaning/maintenance. The most vital part of the party host position, though, is making the guest experience the number one priority, from helping guests with the booking, preparation and customization, through the actual event - facilitated by you - and through follow-up contacts after their event. Party Hosts work nearly every weekends and can be part- or full-time. All Party Hosts are promoted from Hosts, but select Party Host below if you think this is where your passion is. Every member of the team at Bounce Milwaukee is a host, but only a select few will be chosen to become Axe Coaches. Axe Coaches are trained to operate not only each of Bounce Milwaukee's attractions (laser tag, the inflatable sports arena, the rock climbing wall, and the inflatable obstacle courses), as well as instruction on hosting the front counter, food service, and cleaning/maintenance, but will also undergo specific training on the safe use and maintenance of Fling Milwaukee's axes. Axe Hosts work on weekends, though many are full-time as well. Applicants can be both Party Hosts and Axe Coaches, but select Axe Coach below if you think this is where your passion is. Remember that teacher you had who was funny and creative, who was available for extra help when you needed it, and always held you to a higher standard? The one you wanted to impress, or at least made you look forward to that class? Managers at Bounce Milwaukee will have those same traits. You'll be trained on every aspect of operations from running the attractions to food service and cleaning/ maintenance, and will be the type of person who will both efficiently delegate responsibility and will take initiative to complete tasks yourself. You'll be responsible for supervising and motivating a team of energetic and creative hosts, as well as ensuring the guest experience at Bounce Milwaukee (and Fling Milwaukee) is incomparably great. While a demonstrated capacity for leadership is an absolute necessity, we'll provide and pay for additional training and certifications specific to the position. Managers are generally promoted from within our current team, rather than hired outright, but select Manager below if you'd like to be considered. If you can problem solve, use a multimeter and solder, we should talk. This could be a handful of hours a week, where you set your own schedule, or could be combined with any of our other positions to be part- or full-time. Please pretend that "children" in the questions below means "circuit boards". No specific degree or certification is required, but candidates should be familiar with basic problem solving, multimeter and soldering skills. Experience with PCB (circuit board) repair, or experience working with solid state / DMD pinball machines and/or arcade games is a plus, though not necessary. Laser tag repair work is modular, and requires only problem solving skills and cursory computer skills. As of Winter 2018, we're searching for a General Manager who can help take us to the next level. Bounce recently transitioned from fast casual to a full-service restaurant. We're therefore seeking someone with restaurant management experience, but someone who can both innovate and listen to and acknowledge the strengths and knowledge of our current staff. You'll need to be a problem-solver who understands that we do things differently, and to keep our concern for our employees and community a priority. We believe in growing our staff into leaders, so we almost exclusively promote from within the organization. Our General Manager position is the only exception, so we'll work with you to ensure that you have a knowledge of the many skills that our amazing staff have as you transition into your role; you'll be trained on every aspect of operations: running the attractions, party hosting, food service and cleaning/ maintenance, and will be the type of person who will both efficiently delegate responsibility and is able to model best practices yourself. You'll be responsible for supervising and motivating a team of energetic and creative hosts, as well as ensuring the guest experience at Bounce Milwaukee is incomparably great. While a demonstrated capacity for leadership and a track record of successful restaurant management is an absolute necessity, we'll provide and pay for additional training and certifications specific to the position. 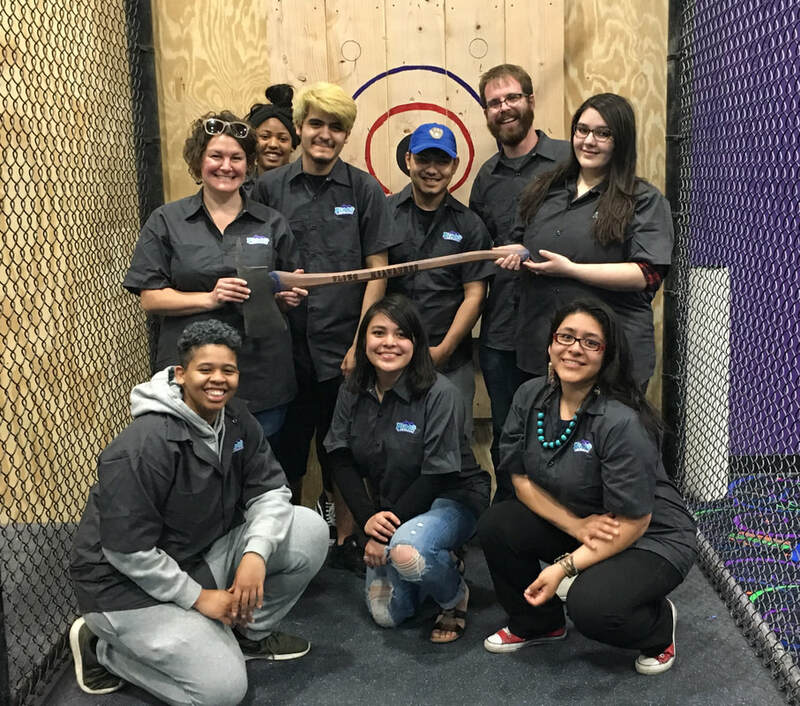 You may be ServSafe certified, or have a bartender's license, but if you haven't been trained at axe-throwing, we've got your back. Fill this box up! Maybe we'll ask you put those unicycle skills to work bringing pizzas to tables or help you develop a magic act for parties. Pig Latin and Klingon do not count, though we're still impressed. Be sure to email your resume (and references) to bouncemilwaukee@gmail.com after you submit this online part of this application. Applications without a resume will not be reviewed. As we get hundreds of applications per month, please do not call us after you submit your materials. We'll review all of them, we promise.